Amazon Prime Day 2018 is officially 1 week away! It has finally been announced that Amazon Prime Day 2018 will begin on Monday, July 16 at 3pm EST and go through Tuesday, July 17. That means we have 36 glorious hours to buy (and sell!) thousands of different products at a huge discount. It’s the day in which Amazon celebrates it’s “birthday” by treating its Prime Members with loads of discounts and savings on some of the hottest selling items available. 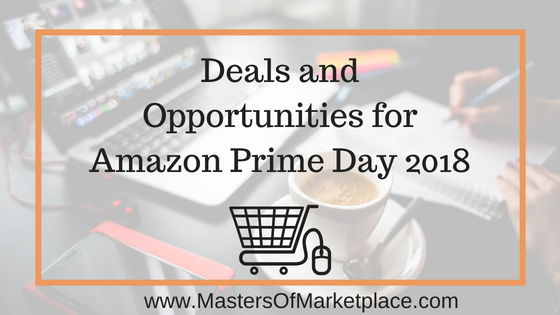 It’s also the day where sellers can take advantage by offering huge discounts to customers who are ready to one-click their order of whatever it is you are selling them that day! This year marks the fourth year Amazon has picked a day close to its “birthday” to celebrate by offering Prime Members incredible savings on a plethora of products. I highly recommend you download the app to get notified when items you want to buy go on sale. If you’re already a Prime member, then you’re good to go. Just sit back and wait for Monday and get ready to start shopping. A 1 year Amazon Prime membership costs $119 and includes free 2 day shipping, access to free ebooks, thousands of movies and TV shows, millions of songs and even cloud storage. And if you’ve ever thought about selling on Amazon (we all know how fun the buying part can be! ), I’ll tell you EXACTLY what to need to determine whether selling on Amazon is right for your business. Click here to access the free 10 minute video that reveals: Is Selling on Amazon Right For Your Business?